Far longer than a “short beach run” later, we arrived home soaked to the bone. 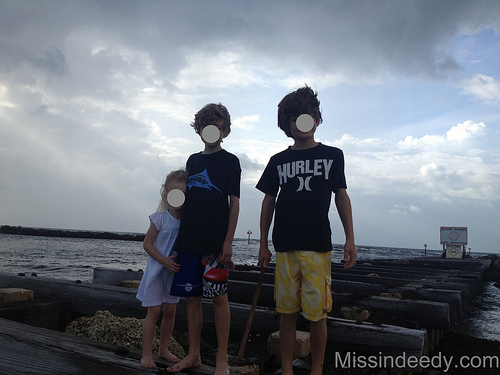 You see, Captain Ahab thought it would be a mighty fine idea to walk the kids (including the littlest – Sweetgirl) all the way to the jetty. And back. From where we started out, it was a good quarter-mile (or more) there, and then another good quarter-mile or more back. That would have been great if we just had the two 9-year-old boys. Alas… Halfway TO the jetty, Sweetgirl started telling us that her legs were tired of All The Walking. Not a good sign. Just about the time Ahab and I realized we should probably start heading back from the jetty, the skies decided to get angry. We tried to shuffle the kids away, but dang it, there was a hot-pink mask washed ashore that was just Sweetgirl’s size, and a half-dead sea fan that begged to be brought back (despite the stench); not to mention the two turtle hatchling eggshells we found. Oh, The Excitement! Unfortunately, all of The Excitement made trying to hurry them along kind of like herding cats. Only, harder. All that to say, about 2 minutes into our 15 minute walk back, the skies opened up and rained on our beachy parade. Here are a few things I heard from the lolly-gaggers before one of them needed to be picked up to keep the party moving along. We did make it back. Wet, but happy to have enjoyed the adventure. And to have made it back without getting struck by lightning. Obviously. As, I’m now sitting here in the comfort of the house telling you all about the latest adventure “abroad”. Only, “abroad” is really just down South from up North. Indeed. 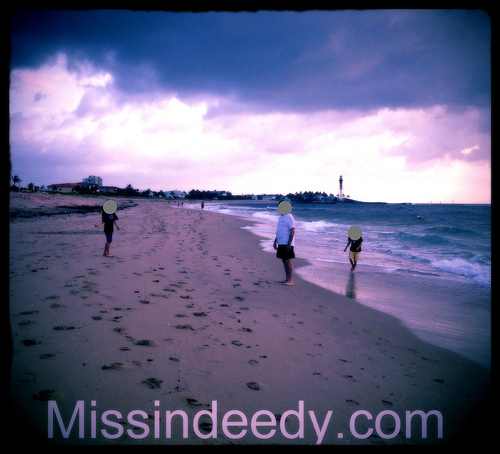 This entry was posted in Family, Vacations, Yes, Indeedy and tagged beach, Captain, Florida, Hatchling, ocean, sun, Turtle. Bookmark the permalink. Good golly! I’m a little jealous that you are on the beach in Florida, rain or not!! Sounds like you’re having great fun already and making memories that will last a lifetime, even if the poor kiddos legs are tired out. I love your cousin’s perspective. That’s just what Josh would have said. Those are the childhood memories that grownups cherish most. A pleasant but uneventful walk to and from a jetty would be long forgotten! Those are the memories that children cherish most. Much better than an uneventful walk to and from a jetty. That would be long forgotten. Thank you SO much for stopping by for a visit! Yes, it is so true, isn’t it? They’ll remember the downpour as more fun than any other part, no doubt. I’ll bottle some up and bring it back for ya, kay? I love to make you laugh! Oh how fun! What great memories she’ll have to laugh about later! Hope the weather clears up for the rest of your trip! It’s great how the kids can have a good time no matter what the conditions are. Too hot at the beach? NO! Too wet at the beach? NO! 🙂 Hope the sun comes out for you! Oh, indeed Christina! Indeed! And the sun must have heard you, as it’s on it’s way today! Finally!